It is a lesson for kids (we used it in a group from kindergarten through fifth grade) about God’s hatred for sin and punishment of sin done in an age appropriate way. I think this is an aspect of God which is vastly under-taught in children’s ministries today. So, here it is. The Biblical text is taken from the NIV translation. Words directly from scripture are shown in red. Where I have shortened or made the scripture more “age appropriate,” that is reflected in black. I have tried to be as faithful to the original text as possible, but it is important to distinguish God’s words from my own. Click here for a print friendly version of this webpage. DIRECTOR: Now we’re going to put on a play. We haven’t really had any time to rehearse, so I’m going to need some help. I need a bunch of actors for this one. You don’t have to memorize any lines, just mouth them as the narrator reads them and make the appropriate gestures, facial expressions and actions. Let’s do a test to see who should be in our play. Lead entire class in “acting” exercises. DIRECTOR: Let’s test this and make sure you all know what you’re doing. Everyone react accordingly as I read this next sentence as if it were your character. Character (that’s all of you) said, “I can’t believe that monkey jumped out of the tree and landed on my face. That hurt. I was jumping up and down (on one foot) spinning in circles and screaming. Then I stopped screaming and jumping up and down and I said, “I don’t think I like monkeys anymore.” Then I walked slowly down the lane swinging my arms back and forth and whistling. It was a hot day. It was a very hot day. That’s great; I think you guys are ready. We’re ready to pick our actors for the play. Stage Manager (stage manager should be pre-selected and an older child/small group leader so they can be prepared for their role which includes moving props and people as appropriate). Stage is set with a tent and a tree on the left side of stage. Abraham should be standing near tree. With the Lord and two Angels standing off stage ready to make an entrance. NARRATOR: Terah (tear-ahhh) took Abram, Sarai and Lot his grandson from Ur to Haran. When Terah died in Haran, Abram traveled with Sarai (sa-rye) and Lot to Canaan. Because God’s hand of blessing was on Abram, he made a covenant (or promise) with him that he would be the father of all nations. He would also give his descendants the promise land (Canaan). DIRECTOR: But what you need to know for our play is what happened after that…..
NARRATOR: God blessed Abram so much that his cattle and herds grew and grew. In fact, they grew so much that there wasn’t enough green pasture for them to graze on. Lot’s herd and Abraham’s herd (remember kids that God changed his name to Abraham and Sarai to Sarah when he gave him the promise of Isaac) needed to separate. So Abraham gave Lot his choice as to where he wanted to live. DIRECTOR: Well, Lot went to the Jordan valley, but that really didn’t work out so well, he ended up in the city of Sodom. Unfortunately what Lot didn’t know is that the city of Sodom and Gomorrah had very, very evil people living in it. For I have chosen him, that he may command his children and his household after him to keep the way of the Lord by doing righteousness and justice. DIRECTOR: OK, everyone to your places. Sodom and Gomorrah, Scene 1, Take 1…Lights, Camera, Action! NARRATOR: 1 The Lord appeared to Abraham near the great tree of Mamre while he was sitting at the entrance to his tent in the heat of the day. It was very hot! Allow time for actors to act out their best “hot.” Director will help with cues to actors as necessary to prompt their involvement. NARRATOR: 2 Abraham looked up and saw three men standing nearby. NARRATOR: After talking for a while about Abraham’s promised son, the three men got up to leave. 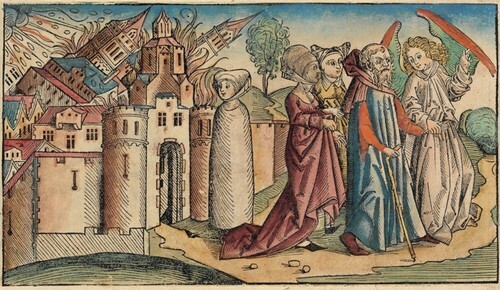 16 …they looked down toward Sodom, and Abraham walked along with them to see them on their way. DIRECTOR: Cut! Cut! Cut! I haven’t seen walking like that since I watched that documentary about ducks. Walk like this. Oh, and Sodom is that way. OK, places everyone. Lights, Camera, Action! NARRATOR: 22 The men turned away and went toward Sodom, but Abraham remained standing before the LORD. Allow time for angles to set off towards Sodom. Stage Manager should stop them short of Sodom to reappear in a later scene. DIRECTOR: Cut! Cut! Cut! Ok Abraham. Picture this. You’re talking to, oh I don’t know, God! The Creator of everything. The Judge of all the world. If I questioned God, I would be very very afraid! So, let’s try that again, and look a little bit scared..a little bit apprehensive! OK and action! DIRECTOR: Cut! Cut! Cut! Wow Abraham! That was bold talking to God like that. Picture it, you’ve just finished talking to God, the same God that judged Cain, and the people at the Tower of Babel and the people in Noah’s time, a God who hates sin and will punish sin, and He has told you that he will spare the city your nephew lives in if only he can find ten righteous people. That is awesome mercy towards the people of Sodom and grace towards you. You must be relieved. Let’s try that one more time. This time, let’s have a big sigh of relief when God says OK.
NARRATOR: 33 When the LORD had finished speaking with Abraham, he left, and Abraham returned home. DIRECTOR: And, cut. Nicely done people. Let’s set up for scene two. Right side of the stage set up with a “Welcome to Sodom” sign written on cardboard. Lot is sitting by the gate watching and several Sodomites are also sitting near the gate looking very menacing. Lot’s “house” set up on left side of stage perhaps with a sign reading “Welcome to Lot’s House”. Narrator to deliver following lines while stage is being set up. NARRATOR: Wow, our story so far is pretty amazing. God himself came to see Abraham and told him what the plan was for Sodom. God was going to judge the sin of Sodom by destroying the entire city. God is a just God which means that he has to punish sin. He is also a loving God though, and he was willing to spare the city if only ten righteous people could be found. Let’s see what happens next. DIRECTOR: OK people, now we’re moving on to Scene Two. This one is set in the entry way to Sodom. Lot, you are sitting here in the gateway. Sodomites, you’re milling around here in the town square probably up to no good. You are evil afterall. Angels, you’re approaching the city gate on the mission God has sent you on. Ok, everyone to their places. Sodom & Gomorrah, Scene Two, Take 1, Lights, Camera and…wait for it….Action! NARRATOR: 3 But he insisted so strongly that they did go with him and entered his house. Prompt Lot’s daughters and wife to join him in the house. NARRATOR: He prepared a meal for them, baking bread without yeast, and they ate. DIRECTOR: Cut! Come on, we need Food Channel type Iron Chef cooking. You know wild mixing of ingredients, flipping and throwing food in the air, big fires, you know the drill. Your secret ingredient is……Bread! Take it from top. Lights, Camera, Action. NARRATOR: Now, the men and women of Sodom did not follow God. They were involved in all kinds of sin. Before Lot and the visitors went to bed, all the men from every part of the city of Sodom—both young and old—surrounded the house. 5 They called to Lot, “Where are the men who came to you tonight? Bring them out to us.” They wanted to do bad things to them. DIRECTOR: Cut! Come on Sodomites. You are evil! You want to hurt those men. Let me see your best evil faces. OK and action! NARRATOR: 9 “Get out of our way,” they replied. And they said, “This fellow came here as an alien, and now he wants to play the judge! We’ll treat you worse than them.” They kept bringing pressure on Lot and moved forward to break down the door. NARRATOR: 10 But the men inside reached out and pulled Lot back into the house and shut the door. 11 Then they struck the men who were at the door of the house, young and old, with blindness so that they could not find the door. DIRECTOR: Cut! Cut! You guys don’t look blind; you just look like you haven’t had enough sleep. Let’s see your best stumbling over one another type blindness. Excellent! Let’s pick it up from there. And, action! NARRATOR: 14 So Lot went out and spoke to his sons-in-law, who were pledged to marry his daughters. He said, “Hurry and get out of this place, because the LORD is about to destroy the city!” But his sons-in-law thought he was joking. DIRECTOR: Cut! Even though God had struck Lot’s sons-in-law blind, they still thought Lot was joking. They must have laughed and scoffed at him like the people did to Noah when he was building the Ark God had commanded him to build. Let’s see your best laughing and mocking. …..and action! NARRATOR: Lot and his family fled. 26 But Lot’s wife looked back, and she became a pillar of salt. Room goes black and stage manager replaces Lot’s Wife with a pepper shaker. DIRECTOR: Really People! Really! Pepper. The Bible clearly says she was turned into a pillar of salt – not pepper. Let’s try that one more time and get it right this time. Places everyone, and action! Room goes black and stage manager replaces Lot’s Wife with a salt shaker. DIRECTOR: Much better. Let’s see what happens next, and action! Cue Raining Sulfur Video and Ring of Fire music. NARRATOR: 23 By the time Lot reached Zoar, the sun had risen over the land. 24 Then the LORD rained down burning sulfur on Sodom and Gomorrah—from the LORD out of the heavens. DIRECTOR: Cut! Cut! That’s burning fire and hot ashes people. Let’s see that anguish and pain. Play it up people. This is your big scene. And, whose idea was Johnny Cash. Let’s cut that this time. Let’s take it from that whole raining sulfur thing again. And, action! NARRATOR: 24 Then the LORD rained down burning sulfur on Sodom and Gomorrah—from the LORD out of the heavens. 25 Thus he overthrew those cities and the entire plain, including all those living in the cities—and also the vegetation in the land. NARRATOR: 29 So when God destroyed the cities of the plain, he remembered Abraham, and he brought Lot out of the catastrophe that overthrew the cities where Lot had lived. DIRECTOR: That’s the end of our play. Let’s have all of our actors and actresses come up and take a bow. You can return to your seats now. Actors dismissed back to their spots. Teacher #1: So, like he had with Adam and Eve, like he had with the people in the time of Noah, like he had with the people building the Tower of Babel, God judged the sins of the people he had created. God is a just God who cannot allow sin to go unpunished. The people of Sodom & Gomorrah had sinned, and God was right to judge them. The judgment he pronounced on those cities was that he would destroy them. Teacher #2: But, God decided to save some people in that city. Who did he decide to save? Teacher #1: That’s right; he saved Lot and His family. He didn’t save them because Lot didn’t sin. Lot was a sinner just like we all are. He saved Lot because Lot chose to listen to God and follow Him. God made a way out for Lot and His family, but He had to listen to God. That was pretty good news for Lot and his family wasn’t it? Teacher #2: That was great news for Lot and his family, and you know what? We sin too. We all do. I do. Ms. Heather does. Ms. Darcy does. Your small group leaders all sin. Your teachers sin. Your parents sin. You sin. We all sin. We might not commit the same types of sins that the Sodomites did, but we all sin. We all do things that are the opposite of God’s will for us, and that is sin. Teacher #1: And like the Sodomites, our sin deserves to be punished. God created everything to be perfect and holy (that means set apart), but God is the only one who is perfect, the only one who does not sin, and because of that he is just and right to punish us for our sins. Teacher #2: But, like Lot, God gives us a way out too. He sent his son, Jesus Christ, to come to earth, lead a sinless life, die on the cross for our sins, and be raised again on third day. Jesus died for our sins, and when we make Him the Lord of our life and choose to follow Him, we can be reconciled to God and live forever with Him the way He designed us to. That is really Good News! We’re going to talk more about why God judges sin in small group. Dismiss to Small Groups for prayer and further discussion. Tony Kummer (Editor) reviewed & updated this page on : April 13, 2011 at 8:43 am. All our content is peer reviewed by our readers, simply leave a comment on any post suggest an update.